The first Ebenezer Art Show was held in 1978. Proposed jointly by parent Carolyn Auld and Ebenezer teacher Lyndall Harrison, the idea received strong support from the Ebenezer P&C Association, the executive of the association at the time being Yvette Kemp (President), Lynn Popplewell (Secretary) and Dot Schmidt (Treasurer). Original art work not being in plentiful supply in the Hawkesbury in 1978 and Ebenezer being considered too far out of the city suburbs for artists to deliver their work, it was arranged for metropolitan artists and crafts persons to drop off their paintings or craft at a home in Pennant Hills. From there it was transported by parents or school staff to Ebenezer. Display space at the first art show was limited to a six-module demountable library for art and the original brick classroom for craft. It attracted only 130 paintings (35 by the same artist!) but a large exhibition of a variety of craft. The function was well patronized – on opening night there were 100 people crammed into the library. It was opened by artist Warwick Fuller. Paintings to the value of $2170 and craft valued at $903 were sold, the P&C realising an overall profit of $730. From this small beginning the art show was held each year and grew in size and popularity. Brick classrooms built in 1982 provided an attractive area for display of paintings and pottery and the addition of a double classroom in 1994 was used for outstanding displays of craft. 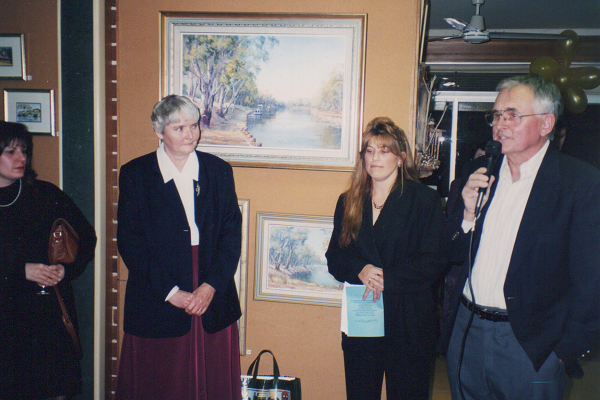 With refinements to procedures and oversight for many years by Sue & Ted Brill, plus continued support by the P&C Association and school staff, the show became so popular with district and metropolitan artists that drop off points in Pennant Hills were no longer required. If artists wanted to display their work they had to deliver it themselves – and they did – to the extent that entries per artist had to be limited. In later years the addition of a school hall provided a new venue for this exhibition and the art show continued. The staging of an art show is a huge undertaking, especially for a small school such as Ebenezer. Parents and school staff over the last 40 years are to be thanked and congratulated for what they have achieved. While the primary aim of Ebenezer Art Shows was fund raising for the school this annual event has made a large contribution to the promotion of art and artists and it has provided an opportunity for students of the school to view and appreciate original art work. Ebenezer Art Shows have also been events that have been enjoyed and well-supported by the local Ebenezer community; they have generally enhanced the fine reputation of Ebenezer Public School in the Hawkesbury district.